중국 경덕진(景德鎭)에서 우연히 방치되어 버려진 도자기 유물파편 더미들을 보았을 때 나는 문화적 충격을 받았다. 송(宋) 대의 갑발(匣鉢)과 그 속에 들어붙어있던 백자는 생명력(vitality)의 함의를 직관하게 해주었다. <再-만들다>의 경덕진 시리즈는 버려져 방치된 오(五)․송(宋)․명(明)․청(淸) 시대의 도자기 유물파편들을 수집하여 활용하고 있다. 버려진 도자기 파편들을 접목하여 반복과 직접기법을 통해 과거와 현재와 미래를 잇는 시공간을 초월하는 원형의 상징적의미를 부여함으로써 무한한 생명력과 삶의 반복성을 보여주고자 하였다. 남들에게 버려진 파편들은 보잘 것 없는 수치일 수 있으나 나에게 버려진 파편들은 생명의 끝이 아닌 새로운 탄생을 위한 전제조건이며 출발이라는 관념이다. 무한한 원의 형상을 기본으로 하는 나의 작업은 한결같이 하나가 곧 전체임을 이야기하고 있다. 나는 본 작품을 통해 ‘버려져 남은 하나가 잃어버린 아홉을 대신할 수 있다.’라고 믿는다. When I saw pottery shards in Jingdezhen, China, which were neglected and thrown away, I experienced a culture shock. Shards of Sagger of the Song dynasty, which formed a massive mountain after being discarded a thousand years ago and white porcelains being attached within led me into an intuition of implications on vitality. 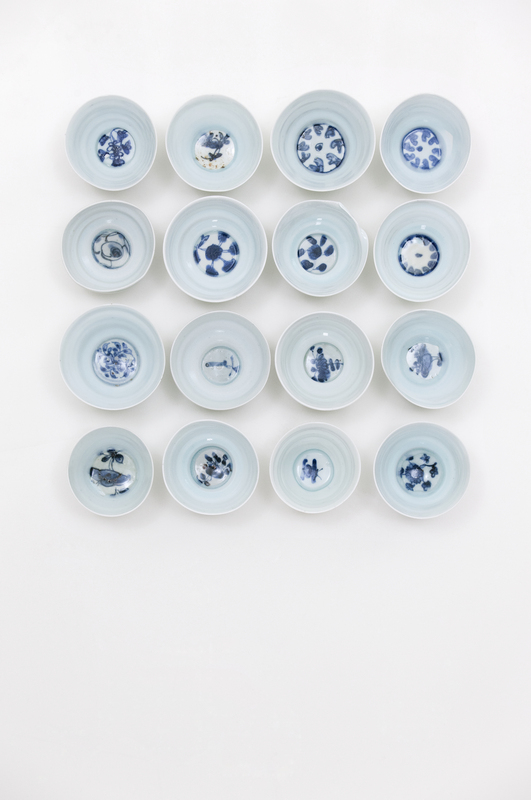 The Jingdezhen series in <Re-born> collects and utilizes pottery shard heritages of the Five, Song, Ming and Qing dynasties which are discarded and neglected. I intend to show the limitless life force and repeatability of life by giving symbolic meaning of the archetype transcending space-time to shards of pottery which were excavated from a site in the city of Jingdezhen and then thrown away. By combining the pottery shards repeatedly and directly, I tried to how the limitless life force and repeatability of life through the past to the present. Shards thrown away by others may be trivial things, but shards thrown to me, I think, are prerequisite for the start of life, rather than the end of life. Based on the from of the limitless circle, my work consistently communicates that one is nothing but the whole. I believe that “one that remains can replace nine that were lost” through this work.